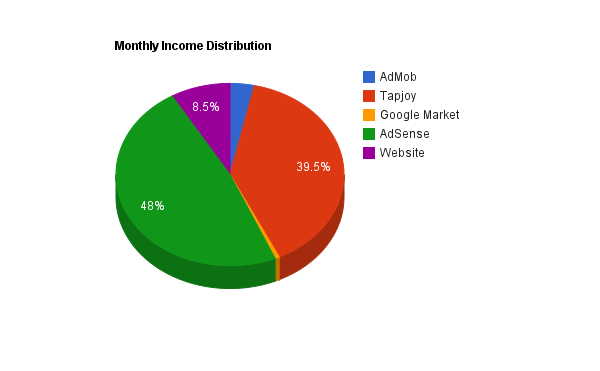 While AdSense (website advertising) accounted for most of my income, there is still a significant portion coming from Tapjoy. This is a remnant of the Google+ Invites saga. The new app, titled “Social Invites Plus”, has had a few hundred installs, so I was able to send out a few more invites. But for the most part, this app died off when the old version was suspended from the Android Market. It’s become too difficult to constantly track all my apps in the Android Market, and generate cumulative download/install stats. Google doesn’t seem to have any easy way to export this data in a convenient format. Instead, I’m using a third party tool called Distimo to monitor my app installs and rankings. You may recognise the name – Distimo publishes a regular report on the state of various app stores, including the Apple App Store, and Google Android Market. As of this month, I’ll be trying out Distimo as a way to keep track of my apps in the Market. It doesn’t support SlideME yet, but most major app stores are supported. 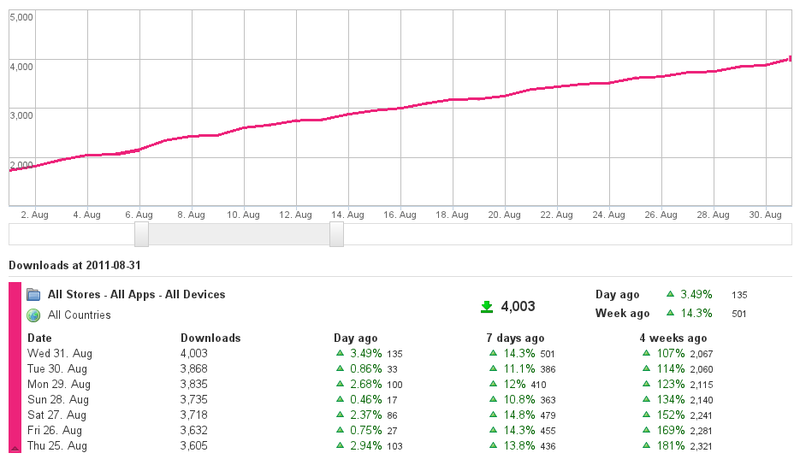 If you click the image above, you’ll be able to see a large screenshot of my downloads report for August. 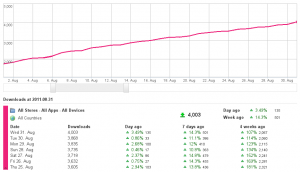 Distimo estimates that by the end of August I had a total of 4,003 downloads. This is significantly less than my own count for July (~14,000), but ignoring the Google+ Invites app it seems pretty close to the mark. I’ll have a look in a few months time and see if the stats have caught up (or perhaps it ignores suspended apps?). This month saw a dramatic decrease in nearly all income streams compared with July. I was expecting that, because most of last month’s revenue came from the Google+ Invites app anyway. But looking on the bright side, my income for August was still significantly higher than the first 3 months. This was my second strongest month yet. So yes, despite the decrease in total revenue, I still consider this to be another positive month. I did practically no work, and still came out with the second best month since I started this blog. Looking ahead, in the next few months I’ll aim to release a few more updates, and a couple of new apps to hopefully boost the revenue back up again.